Do Injured Passengers Have Legal Options? As a passenger in any vehicle, we are completely relying on the safe driving of the driver of the vehicle we are in and other drivers on the road. But sometimes accidents are unavoidable, and passengers are injured in motor vehicle accidents. Being involved in an automobile accident can leave a passenger with serious injuries and confusion as to who should be responsible for paying medical expenses and compensating other losses resulting from the injuries. Who is responsible for compensating medical bills and other losses? As a passenger injured in a vehicle accident, the state of New Jersey’s no-fault insurance policy laws may require you to seek compensation from your own auto insurance policy first, even if you were a passenger in someone else’s vehicle. If you do not own your own vehicle and do not have your own automobile insurance, then you would be able to seek compensation from the at-fault driver’s auto insurance policy. In some cases, you may need to sue the at-fault driver to receive compensation for your medical expenses and other losses. If you are a passenger on public transportation such as a bus and are injured in a public transportation accident, you may need to sue a municipality. In most personal injury claims you have two years from the date the accident occurred to file a claim, however when dealing with local governments, you must provide a Notice of Claim within 90 days of the date of the accident to be able to sue the municipality. When purchasing automobile insurance in the state of New Jersey, you have the option of choosing “zero threshold” or “verbal threshold” within your personal injury protection coverage. This election is important because the type of coverage you have can determine your right to sue for compensation for pain and suffering when injured in an accident. If you elect the verbal threshold, also known as the lawsuit limitation option, you may only sue in cases of extremely serious or permanent injury, even if the other driver is completely at-fault. The verbal threshold option often results in lower premiums but has a higher risk. If you elect the zero threshold, also known as the no limitation option, you retain your right to sue to recover compensation for pain and suffering without limitation. 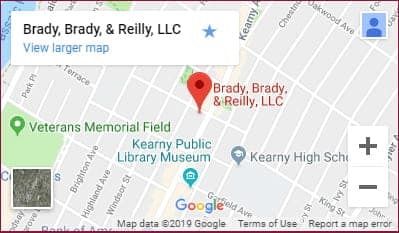 The accident attorneys at Brady, Brady, & Reilly, LLC have been fighting to protect the rights of injured passengers in the state of New Jersey for more than 50 years. If you or a loved one has been injured in an accident while you were a passenger, contact us today to discuss your case and let our experienced personal injury attorneys fight to protect your rights to compensation for your injuries. Call us at 201-997-0030 or contact us online for your confidential and free consultation. We look forward to speaking with you.